Summer is here! It’s such a good feeling to shed the puffy vests, don the shorts and get outside. Do you already have your adventure agenda lined up for the summer? I hope NW Healthy Mama is inspiring you to take the kids out and explore new hikes, go kayaking, visit gardens and discover new corners of the Northwest! However, this is not the season to let your strength and general fitness dwindle. Staying active is imperative, but regular strength training is still very important. 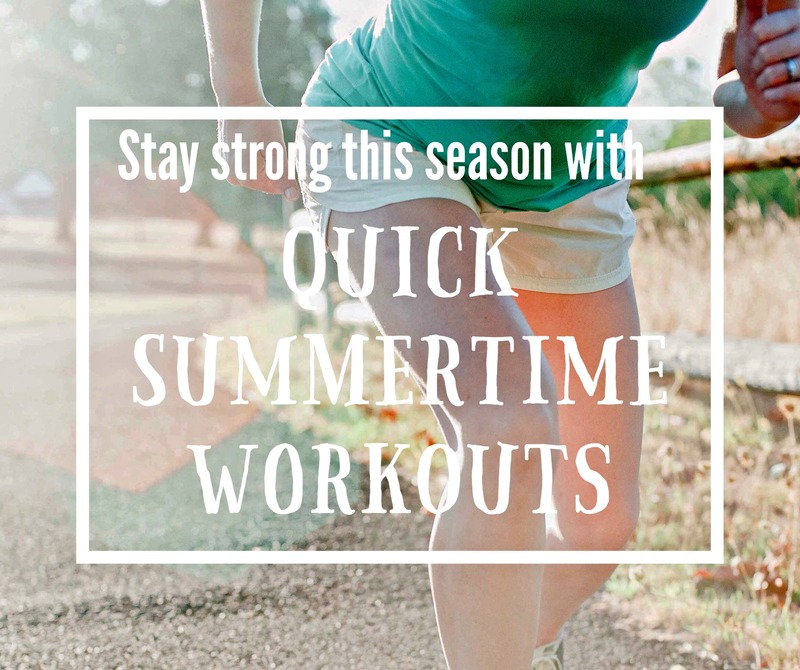 Strength training gives your body the strength, stability and structure to do all of these fun summer activities without feeling zapped or on the verge of injury. I’m sure that you have zero desire to be spending hours in the gym right now, but if you neglect your workouts you will certainly regret it by fall. Unfortunately, skipping even just one week of regular strength training will begin the muscle atrophy process. Yikes! You need a way to strength train without having to go to the gym. You also need a really efficient routine that accomplishes a lot for your body in very little time. The routines I’m sharing below are very quick (15-20 minutes), require zero equipment so you can do them in your bedroom or living room, and build strength in every nook and cranny on your body. But beware…sometimes doing quick routines like these means everything is amped up more than normal. Most of the resting has been removed, which also means you’ll be getting a cardio workout at the same time. If you don’t feel like you’re sprinting, you’re already a beast and I’m impressed! How to do it: With each of these routines, watch the quick videos first and practice the movements so you’re not fumbling through it when it’s time to do the full workout. As you begin the workouts, treat the first round of each workout like a warm-up, moving carefully and deeply, practicing your technique and balance. The exercises will naturally stretch and activate your muscles so there is no need to do a separate warm-up. After the first round, pick up the pace and push yourself harder. Workout #1 – Do this circuit 3-4 times through total. Workout #2 – Do this circuit 3 times through. Perform each exercise for 0:30, resting for 0:15 between exercises. Do as many good reps of each exercise as possible during the 0:30 work period. Make it look pretty! Workout #3 – Do this circuit as many times through as possible in 15:00. Take breaks as needed, but push yourself! Be smart. These routines are meant for someone who has some experience with these types of movements. If anything seems like it’s too much or you don’t feel like you are doing it correctly, take a step back and substitute an exercise that you feel more comfortable with. Technique is paramount, so if it’s not pretty, skip it. After doing these workouts for a couple weeks, you will be pleasantly surprised how fit and strong you’ll feel. It’s an amazing feeling when you know you didn’t have to go anywhere or spend hours doing it. Don’t waste your summer in the gym. Go explore the great outdoors and feel strong doing it! Megan Dahlman is a Certified Strength & Conditioning Specialist, Certified Precision Nutrition Coach, and mother of two little boys, Calvin and Peter. She coaches women of all ages toward becoming healthy and fit. She is the creator of www.strong-mommas.com , a website fully catered toward moms who are looking for a more heavenly perspective in health and fitness. She recently launched an online coaching membership that provides all the workouts, nutrition guidance and accountability you need to be a truly strong and healthy woman. Megan lives in Oregon with her husband, two boys, horse, dog and chickens. You can follow her on Facebook @strongmommas and Instagram @strong_mommas.